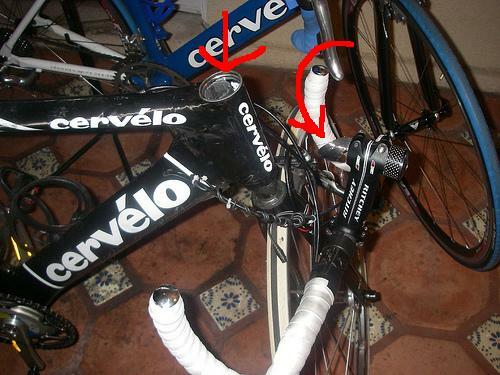 According to his own statement, he „managed to break — various ti [titanium] and steel frames, seatpost collars, wheel rims, etc.“. 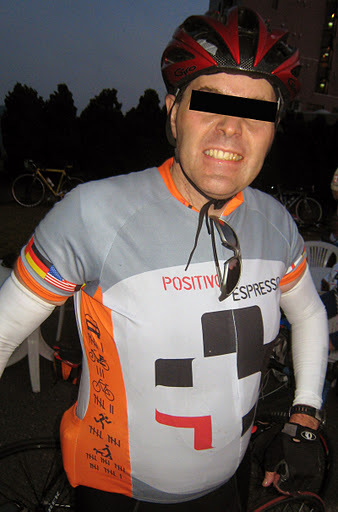 The recalled rider normally wears a Positivo Espresso team jersey, sometimes also an ASSOS Kachastan national jersey. Bicycles should be alert if they here the sound of a bell accompanied by a male voice shouting „torimaaaaaaaaaaaass“. Thanks, Michael! !I’ve never been the subject of a recall before, but I will do my best to reemerge at an appropriate time as a new, improved, stronger, lighter and faster rider, who is easier on equipment and less of a threat to the bicycles of Japan. And please note that I have never injured someone else’s bicycle. If only I rode the „regular“ frame sizes sold in Japan, maybe I could get new models for use as an equipment tester?? My odl Giant TCR carbon frame, Cervelo carbon frame, AND Bianchi Pista Concept 2006 aluminum frames are all rock solid and undamaged.Separately, Azuma Shokai did confirm that they will take care of my Cervelo and will give Nagai-san all the details next Monday. The great thing about Japan is that you can call the importer who last week was skeptical about helping a gaijin who bought a frame abroad, and when they ask you if you have a bike shop where you regularly take your bike, and you say „Nagai-san at Positivo“, they treat you well and say they will call him directly to personally coordinate the repair schedule.If all goes well I will have a new front fork by the weekend of Sept 6-7. Wow. This must have been the fastest comment ever in the history of the Positivo Espresso blog. I am glad that you take the post with humour, I wasn’t so sure when I posted it and ready to remove it and apologize any time.Do you still have a bike to ride out tomorrow, or are you waiting for the fork?